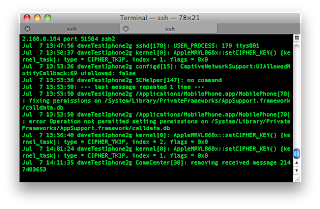 The Internet was buzzing a few weeks ago with Charlie Miller’s iPhone SMS exploit. Reading the vague details available in different news stories it reminded me of some work I had done many months ago that involved a USRP, OpenBTS, and several different phones. The results were pretty spectacular for the same reason Wifi fuzzing found tons of problems: when a developer assumes that there is strict control over both ends of a transaction they don’t do as much error checking as they should. After all, since it's only your code (or other code from friendly people) sending data, then the code receiving data doesn't have to check input. LORCON helped disprove that idea with Wifi. The USRP+OpenBTS combo is doing the same for GSM based handsets. The crinkly bits is that to find bugs with OpenBTS, you have to trick a cellphone into connecting your hostile base-station rather than a commercial cellphone tower. This is why I found Charlie Miller's and Collin Mulliner's research interesting: they claim they discovered a way to inject SMS locally for testing that wouldn’t be seen by your provider, making fuzz testing easier. I have seen local SMS injection exploits before but never for the iPhone, so I thought i’d spend a day poking around and see what I could come up with. The rest of the blog post is an accounting of how I spent the time searching for this vuln, how I duplicated a vuln that fits their description, and what to do next. It worked. 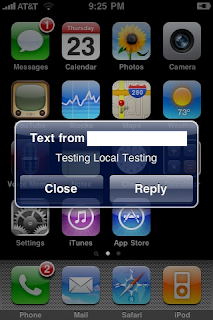 I then tried to send a test message to my own number. I figured this could be the simplest way to achieve the functionality for fuzzing. However, this didn't work so well. Every time I sent a text message to the same number it originated from the baseband would disconnect and no longer receive text messages until the device get a reboot. 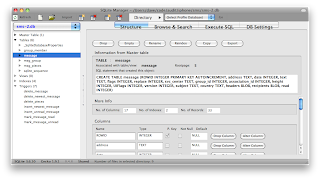 The sms.db overview and structure as seen in SQLite Manager. 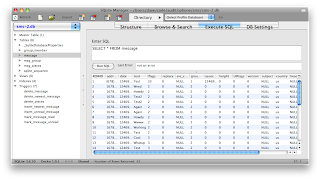 The result of the SQL query "SELECT * FROM message"
After examining the different tables and data it seems that this is where SMS messages are stored to be later retrieved for viewing and such. Using this as a ending point I can work my way backwards to where the messages come from. Next I enabled syslog debugging, so I can information while sending a SMS message to the device, this should help identify processes that are involved in receiving and processing messages. The last message in the log reads "CommCenter: removing received message 2147483653". 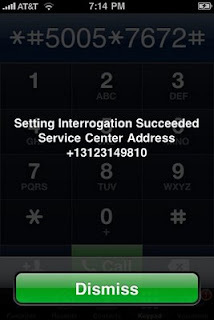 CommCenter is involved in receiving and processing SMS messages to some degree. Searching the disk for CommCenter gives a lot of results but one catches my eye: /private/var/CommCenter/spool. The word "spool" looks similar to the Unix "mailspool", and is likely the place to store files that are being sent or received by the device. The spool directory has two subdirectories MobileOrginated and MobileTerminated. Both directories were empty, but if the Unix style spool architecture is being used, temp files will be created as messages are sent and received and removed when no longer needed. I wrote a quick and dirty Ruby script that will monitor the directory and copy any files it finds, even if they live for only a second. The contents of the /private/var/CommCenter/spool/MobileTerminated direcotry. Examining the contents its pretty easy to see that this is the incoming message I sent from another from. I ha the phone number that the message was sent from, the message, and some unprintable characters. I then copied this file off the iphone to my macbook and used hexdump to view the message to see what the unprintable characters are. 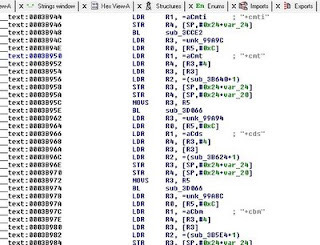 The text message in hexdump. Doing the same for the MobileOriginated directory got a file called p.sms.58. The structure seems almost the same with the destination phone number and the message surrounded by a few unprintable characters. The message I sent was "What up Homey!" 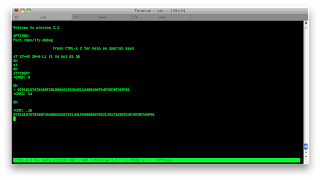 The p.sms.58 message in hexdump. I now know an intermediary point in the SMS delivery process. I attempted to create my own file in the MobileTerminated directory to see if it would be delivered as an SMS message, but no luck. Something is copying the files there then notifying CommCenter there are messages to be processed. 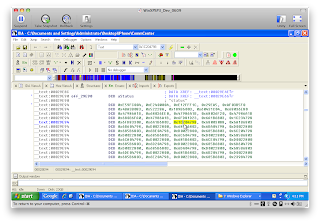 The next step was to analyze the CommCenter binary and find any clues on how it operates and where the signal to process messages comes from. After a few minutes of analysis it seems clear that the baseband module receives the message, and then CommCenter reads it using an AT command. 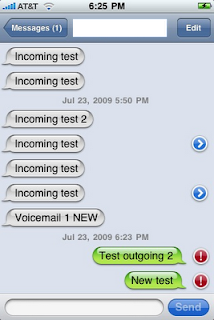 At this point we can break testing into two different parts: CommCenter and MobileSMS. Shows is a message is replacing a current message, like is a newer version is received. Used by the SMS UI to group messages. If this is set to a id that is not also in the msg_group table, the message will not be displayed. If sent to 1 the UI will act as if a URL is present. This information was collected by a trial an error process of sending and receiving messages then duplicating them with different options. If that didn't work I took the SMS message apart and traced it through CommCenter to its insertion in the database. If the field is still blank I can't find anywhere it is actually used and may be used for MMS which I do not have enabled because I am on ATT. Below are some pics of my trial and error process. 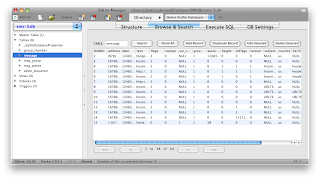 The SQLite view of the test messages. As far as a fuzzer actually goes using Ruby and the SQLite gem means that a fuzzer could be whipped up in a few minutes. Knowing the field input types and the rules around what gets processed vs what doesn't helps speed this process along. A simple script will just open the database, insert several rows, close the database the kill -HUP the SpringBoard process. The HUP seems to help the UI close then reopen the database and process your new messages. Things to try involve long strings, unusually high numbers, and setting values that aren't normally set. Below is an example of a crash received after processing a database full of fuzzed messages. The offsets have been removed so we are not accused of releasing 0-day, how ever if you follow the above steps it is pretty easy to duplicate. Back to testing the code that recieves the message and puts it in SMS.db. Looking back at the sendsms tool it seems the best way is through the use of "/dev/tty.debug". Since the sendsms command to my own address doesn't work lets look at other ways to do it. 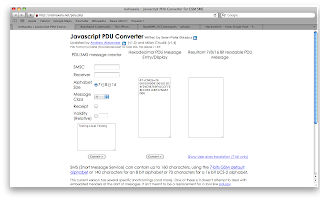 http://rednaxela.net/pdu.php helps you by allowing you to put put in a SMS PDU and it will tell you what it means or you can create your own. A sample SMS PDU is needed. 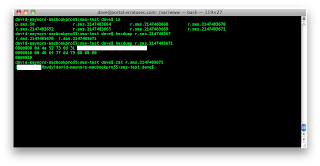 Using minicom on the iphone I connect to the baseband and issue a few commands that give me a binary SMS PDU. 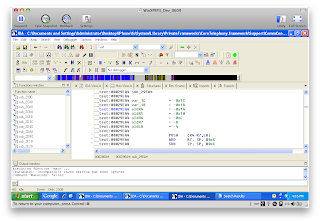 Taking a tour of CommCenter in IDA I trace some code from the function that begins processing spooled messages in MobileTerminated, the the trigger for it. Starting Minicom I sent the message and play around with various AT commands. Referring back to the website earlier that describes a SMS PDU and all the different options allows for quick fuzzer creation. 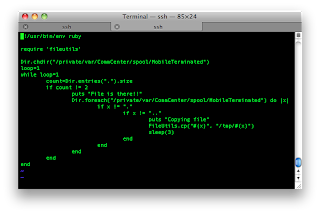 You can write a small Ruby script to take your fuzzzer output and write it to /dev/tty.debug and monitor the results. This path finds as many bug as the other and they should be tracked down and verified. This paper shows the extent that researchers can follow breadcrumbs to reproduce a work. That's the risk of partial disclosure: a simple description, such as "SMS crash on an iPhone" can give researchers enough hints to reproduce the work. I haven't figured how how to successfully exploit the crashes I've found. The SMS network only allow 160 characters through their networks. It might take a multistage process (send many SMS messages with shellcode, then a final message that overflows a buffer to run it). Or, it might be something simple to overwrite a few bytes to unlock a phone. If you're implying that Charlie Miller's claim of successfully fuzzing the iPhone via SMS is a publicity stunt, you obviously don't know what you're talking about. Charlie Miller is a respected security researcher who does not indulge in theatrics. There is also a document called the NDA that Apple makes us sign, which prohibits us from talking about our findings. Were you even at Syscan where Miller revealed his SMS fuzzing? Great write up Dave! With Screenshots too! Herb would be proud... Go ahead and take that 2-hour lunch. You deserve it!